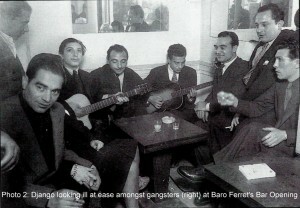 By Roger Baxter There is no reason to believe that Django Reinhardt was a particularly unlawful individual. We do know that he boasted of teaching Babik to shoplift and according to Stephane Grappelli, he was very adept at catching and wringing the necks of chickens on country walks, but these could leniently be considered only relatively minor misdemeanours. He was much too interested in music, women and gambling to be heavily involved in any major criminal activity although it has been claimed that he often cheated at billiards and cards. Despite such indiscretions, I do not think he should be viewed as a thief in the classic sense but more a somewhat eccentric man whose upbringing gave him a very flexible attitude to possessions. You couldn't make this up, Baro and the musette mafia would give the Sopranos a run for their money! @pickitjohn don't thank me, thank Roger who wrote the piece and selected the photos. Thanks Spatzo. Not sure whether the lack of comments means a lack of interest. Oh I doubt it. I myself just didn't have the time yet to read a lengthy article. But I have an itch to do so and can't wait. Thanks Svanis. Glad you enjoyed it. I enjoyed writing this one. Initially it was only going to be about the three Baro opening photos and it grew. I went to the address of what was La Lanterne and had an interesting experience. From the exterior the place looks like an abandoned store front. Looking inside (through breaks in the blinds) I was barely able to identify four or five doors, one right next to the other on either side of the hallway. When the proprietor saw me moving up and down at different angles trying to get a better idea of what was on the interior, they were a little uncomfortable. The proprietor was very reluctant to speak with me but humored me by vaguely answering my questions. The answers that were given to my questions made such little sense when compared to what I already knew and surmised from the inside of the building that I suspect the property has remained in the 'organization' and is still in use to some nefarious activity today. I learned from a friend of mine who is a prosecuting attorney and his father who was in the homicide and now parole departments in Massachusetts that when it comes to interviewing people its easy to find out just as much from a reluctant -vs- voluntary interviewee. It's all in the questions being asked. Jazz music in all it's forms has always had a close association with people on the opposite side of the law. Bousquet and Cardi played at 'Au Son des Guitares' in Marseille for many years. This club was the base of the Corsican mafia in Marseille which was the same group that were responsible for the drug smuggling scandal that was turned into the film "The French Connection" in the 1960's.